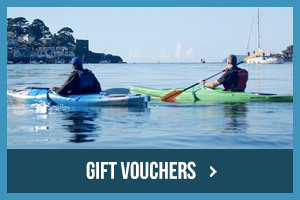 Cornwall Tourism Award winner Encounter Cornwall has been running guided canoe trips and kayak hire since 2006 from our quiet, safe and sheltered village base in Golant at the heart of the Fowey Estuary. Our kayak trips are an ideal introduction to the Fowey’s tidal waters, and are suitable for both families and those new to kayaking. We also hire to experienced paddlers. Explore its Creeks & Backwaters on the high tide – or on the low tide venture down to view it's Wildlife and historic Waterfronts. On both trips you will be paddling through an Area of Outstanding Natural Beauty and a Marine Conservation Area teeming with wildlife that includes kingfishers, herons, egrets, cormorants, various waders and if you’re lucky a seal or dolphin. Our price includes all necessary equipment, leaving you free to enjoy an experience which for many is the highlight of their holiday in Cornwall. We operate throughout the year and only need a minimum of two people to run a trip. With options for everyone from the complete beginner to those who want to be challenged - come and join us on the Fowey and as we say "go with the flow"! "The whole experience with Encounter Cornwall was nothing less than exceptional. 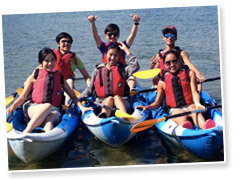 We have done several sea kayaking trips over the years, but this was the first on an estuary. Given our previous experience getting dressed in drafty shacks, the Golant boatshed itself blew us away, with a superb cafe with lots on offer, (the woman running it was very welcoming with loads of advice), toilets, a changing room, and plenty of room to move about and lots of photos and information on previous trips etc. It’s obvious that they care passionately about the environment and encourage several eco-initiatives, without being preachy at all. Dave and the two other guides were fantastic at giving us plenty of info on the surroundings, loads of info about Fowey and the surrounding area that we didn’t know. It was just a lovely trip and a memory that has endured with this particular family, as we keep talking about it a couple of weeks later. Overall the trip down to Fowey and back was brilliant and Encounter Cornwall ensured that we loved every minute of it. Would highly recommend and we’ll definitely be back next year. "